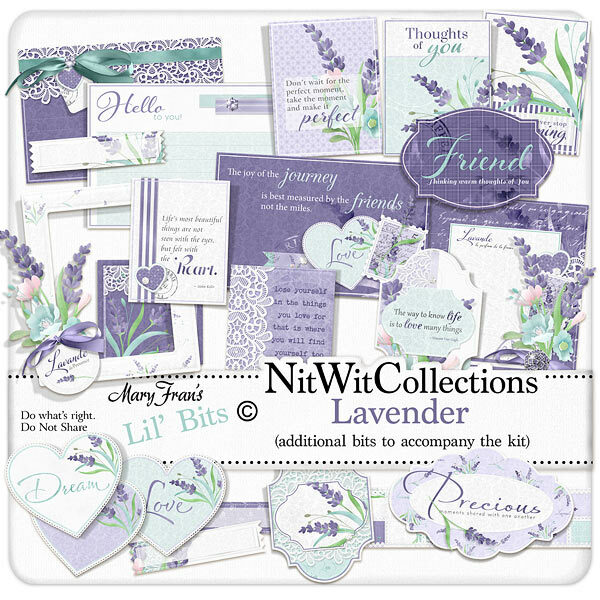 Lil' Bits "Lavender" adds so much more to your creative options with these fully finished digital elements. Well designed journal cards, sentiment hearts, and labels will look stunning and add such interest with the ease of simply placing them into your mini albums, cards and scrapbook layouts. Don't miss out on these digital elements as they are not included in the FQB "Lavender" Collection so please don't miss out on owning and creating with these elements! 1 Frame cluster with the lavender cluster adorning the one corner. Now which photo would be perfect?? 1 Journal card - "Thoughts of You"
1 Journal card - "The Joy of the Journey...."
1 Journal card - "Life's most beautiful things...."
1 Journal card - "Don't wait for the perfect moment...."
1 Journal card - "Never Stop Dreaming"
1 Label - "Lose Yourself in the Things you Love....."
1 Label - "The way to know Life...."
1 Label - "Precious Moments..."
1 Topper that could be a stand alone card with all of its design elements! How will you use this?? ?